“Disney’s Best Kept Secret” is sort of the theme for the Disney Vacation Club, but is kind of hard to believe because at the Mouse-in-Law, everywhere you go you’re tripping over a DVC booth. Here, there’s one in Downtown Disney conveniently located near the tram in case you wanted to do a quick detour before you hit the park. If you decide not to, there are other opportunities inside. I was previously under the impression that there was only one DVC stand in Disneyland, at the Single Most Wasted Space In The Entire Park, but my sharp-eyed readers informed me that I’m just not all that perceptive, since there are additional booths in Tomorrowland and Toontown. Have I mentioned how much I love my readers? I love my readers. Did you ever wish Disney had an outlet store for Disney merchandise? Well guess what! Disney has an outlet store for Disney merchandise!!! 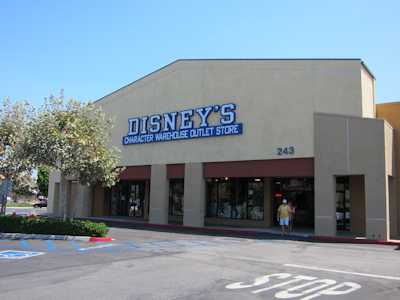 In my opinion, Disney’s Best Kept Secret is actually a store in Fullerton called Disney’s Character Warehouse. Okay, okay, settle down. Before you get TOO excited, it’s good to moderate your expectations. The Disney’s Character Warehouse is run by a liquidation company and can, at times, look a lot like the Island of Misfit Toys. You really don’t know what you’re going to see going in there. The phrase “hit and miss” is practically designed by the DCW. You can get all kinds of stuff in there–everything from contemporary souvenirs to really outdated park remnants. Looking for a mini-football emblazoned with “2009” on it? Disney’s Character Warehouse! Dying for a Christmas ornament from 2007? Disney’s Character Warehouse! My personal favorite are things like gold mouse ears from Disneyland’s 50th anniversary. You know, the one that happened in 2005. They’re also big on selling multiples, like you can currently get Chip and Dale popcorn buckets, buy one get four free. I mean, who DOESN’T need five Chip and Dale popcorn buckets??? By the way, they wouldn’t let me take a picture inside the store. Go figure. And since DCW is really run by a liquidation company, you get some random non-Disney items as well. Some souvenirs are from the Mouse-in-Law, and some have nothing to do with Disney at all and have a Wal-Mart price tag (these are almost always clothes). But don’t be discouraged! You can actually find some cool stuff there, and it’s usually a LOT cheaper than buying it at the park. It’s only a few miles away. So if you have a car and some spare time on your hands, head over to Disney’s Character Warehouse and see if they have souvenirs you really want before you spend big bucks in the park! And as an added bonus, here’s a link with a 10% off coupon! Thanks for reminding me about that place….usually can find some cute Minnie clothes for Katie, and a cute stuffed animal or two for CHEAP!!!! Truly hit or miss, but when it is good……..it is GOOD. We call it Hannah Montana’s final resting place. I do agree w/ your favorite things, I too love the golden mouse ears !!! But you gotta love the place, I have found some bargains there. 60. :), I’m such an enabler ! Hannah Montana’s final resting place–ha! 😆 It’s also High School Musical and Camp Rock’s final resting place too. My daughter’s 2 favorite things are popcorn and Chip and Dale (I know, that sounds like 3 things). Let’s hope there are some left when we come to DL next month. Love your blog Shelby. I’ve been reading for a while but now I’m officially subscribed. Whoo hoo! Thanks!! 🙂 There are TONS of C&D popcorn buckets, so I wouldn’t worry about them being sold out ;). This is AWESOME! Fantastic tip. I’m totally going. Thanks, Shelby! 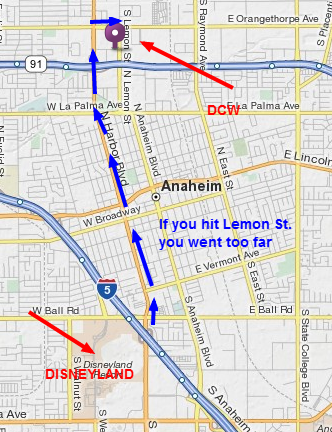 Are you going to the D23 Expo, BTW?